The wife of one of two Reuters journalists jailed in Myanmar made an emotional appeal on Tuesday to Aung San Suu Kyi to free her husband for the sake of their young daughter. 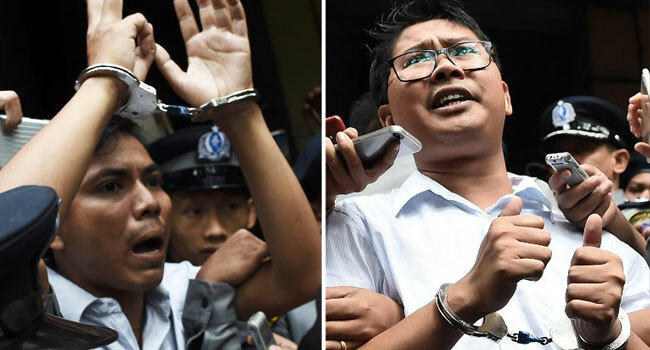 Wa Lone, 32, and Kyaw Soe Oo, 28, were arrested while reporting on atrocities committed during the military’s bloody expulsion of some 700,000 Rohingya Muslims last year. A Yangon court on Monday found them guilty under the Official Secrets Act and sentenced them to seven years in prison, sparking outrage from the UN, EU and US as well as media and rights groups. Suu Kyi was herself subjected to house arrest for some 15 years, relying on foreign media to highlight a plight that kept her away from her own children as they grew up. Kyaw Soe Oo’s wife Chit Su Win, 23, broke down in tears as she asked the Nobel Peace Prize laureate to release her husband, the father of their three-year-old daughter. A UN report last week accused Suu Kyi of failing to use her moral authority to stem the violence last year and called for the generals to be prosecuted for “genocide”. Her silence on the case and the verdict –- the sternest test in recent years to free speech in the country — has shredded her reputation even further. But Aung Hla Tun, a former Reuters journalist who is now deputy Minister of Information, defended Suu Kyi’s reticence. A whistleblowing policeman had corroborated the defence argument that the reporters had been entrapped by police, who handed them documents over dinner shortly before their arrest. But the judge chose to ignore the testimony. Lawyers for the pair will appeal the verdict although the lengthy process will take months, if not years. The country’s president, a close ally of Suu Kyi, could also pardon the reporters but experts say any immediate intervention is unlikely. Erstwhile Suu Kyi advocates overseas have been left dismayed by her attitude to the journalists’ ordeal. Her one public reference to the Reuters journalists during the court case — telling Japanese broadcaster NHK that the pair had broken the Official Secrets Act — was criticised by rights groups for potentially prejudicing the verdict. Wa Lone’s wife Pan Ei Mon described the families’ sadness on seeing the interview, saying that was the moment they “realised that she didn’t know about the case clearly”. US diplomat Bill Richardson, a former confidant and member of her advisory board on the Rohingya crisis, alleged she also denounced the two reporters as traitors during a heated exchange at the beginning of the year. While the case horrified the West, domestically it garnered little public attention despite its implications for press freedom. Response to the jailing was mixed. State-backed media barely mentioned the verdict Tuesday although other papers stood in solidarity with the reporters. A publication called 7Day News branded it a “sad day” for Myanmar and carried a large black rectangle on its front page. The English version of the Myanmar Times ran a full front-page photo of Kyaw Soe Oo, calling the verdict “a blow to press freedom” although its Myanmar-language sister paper was more muted, simply urging the overhaul of obsolete laws. On Facebook — the prime source of news for many in a country that only recently came online — comments were overwhelmingly stacked against the reporters, accusing them of bias and some even calling for a harsher sentence. Pan Ei Mon and Chit Su Win say they just try to ignore the negative opinions about their husbands.